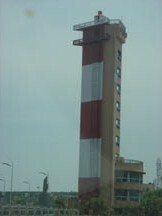 Chennai is famous for its beaches and scenic beauty. Marina beach lies to the east of Chennai (Madras) at Kamarajar Road, 3 Km from the city centre. The fine sandy beach said to be the longest beach in India and one of the longest in Asia, extends to a length of 13 Km, from Fort St. George all the way to Mahabalipuram. There is a drive along the beach fringed with palms and casuarinas running the whole length of Chennai. In early 1880's, the natural beauty of the beach was enhanced by a facelift given by the then Governor Mountstuart Elphinstone Grant Duff. Some of the most beautiful buildings in Chennai such as the Fort St. George complex established by the East India company in 1641, University of Madras, Senate-House, Chepauk Palace (now P.W.D office), 19th century Presidency College building etc are located on the beach drive. On the beach itself there is the Anna Park, named after C.N. Anna Durai, the founder of D.M.K (Dravida Munnetta Kazhakam) and a former chief minister of Tamil Nadu. The park is adorned with statues of famous Tamil writers and sages, flanked at either end by memorials of Annadurai and M. G. Ramachandran, a former matinee idol turned the charismatic Chief Minister of Tamil Nadu. Further south there is a swimming pool, an aquarium located opposite to the Presidency college and two splendid bits of sculpture- that of the Victory of Labour and Mahatma Gandhi. At the other end of the beach is the new lighthouse. The aquarium has a collection of tropical sea fishes and fresh water fishes. To the south of the Aquarium is the historic Ice House (1840) (now known as the Vivekananda house) which was used to store ice brought from England and America for 30 years. Later in 1892, it became a home to Swami Vivekananda and the name was changed to Vivekananda house. The beach can be ideally visited in the early mornings or in the late evenings when the area throbs with activity. Food stalls, hawkers and other entertainers line the beach. The Sunday afternoon market is worth a visit. The large beach is often the venue for important state functions. Kite flying was a common sport and has been banned by the government recently. with the children at the beach and there are also facilities for pony rides. As the undercurrent is very strong, bathing and swimming can be dangerous, and should be done with utmost care.